Please share a memory involving a bicycle that has had a lasting effect on you (whether or not you were the one on the bicycle). I’ve been cycling my whole life. I have a lifetime of memories from my 5-speed stick shift Stingray, to getting my first real road bike, a ‘Mazerati’ that was actually built by Olmo, to transitioning to mtn. biking 16 years later on a Specilized. Would you feel safe riding a bike from east to west through our city with family members? If not, what changes would make you feel comfortable on our city streets? Torrance Blvd. is safe, but most east/west streets are less so. We need to convert Torrance Blvd. and other streets to Class II bike lanes. I think north/south through Redondo is an even bigger problem. Would you support an annual active transportation community event (similar to LA’s CicLAvia) which would close a few streets for an afternoon and allow citizens to bike, walk, skateboard, and enjoy other healthy modes of transportation? Yes! Sounds like a great idea. Currently, bikers face the same traffic fines as drivers, up to $500. Several cities like Huntington Beach created optional classes allowing first-time offenders to go to “Biker’s Education” once to learn safer practices in lieu of paying the full fine. Would you support a similar program in our city? Yes. It’s much better to leverage the opportunity to educate cyclists to improve safety instead of simply ticketing them. In 2011, after 2 years of community input and a $240,000 professional study, the City Council unanimously adopted a comprehensive 20 year Bicycle Master Plan for an interconnected bikeway network with 28 new bikeway miles. How many miles of new bicycle facilities would you commit to implementing each year? I demonstrated my support last year by approving approximately 8 miles as the Council Member in Redondo Beach, and will be approving more this year and over the next four years if re-elected. I will not commit to a set mileage, however. That could prejudice my decisions. The three beach cities are studying the addition of bike lanes on Aviation to allow better commuting across cities. Do you support new bike lanes on Aviation without removing any traffic lanes? With proper funding, planning and cooperation from Hermosa Beach, I will support the bike lanes on Aviation Blvd. It’s not an easy road to implement bike lanes, but the current situation is unsafe for bikes and needs a design to make it safe. The county provides sales tax monies, called Measure R funds, to each city for transportation only. Many cities like LA, Long Beach, and Redondo are spending 10% of these to fund bicycle and walking infrastructure. Would you continue to support Redondo’s approach for bike and walk infrastructure if elected? I attended 3 of the 4 public workshops on the Herondo/Harbor Dr. design for a cycle track and roundabout proposed by Santec Consulting. I support our approach and plan to continue it if re-elected to the Council in March. Over the past 5 years, Redondo Beach has received millions in funds in state and county grants for cycling. Our city has been in the forefront of applying and receiving these grants. Would you support staff time for continuing to applying for bicycle infrastructure grants? The skill set Bob Boardman and others on our staff bring to the grant application process is invaluable. He and others are why we’ve been so successful. We are lucky to have him, and I plant to continue my strong support for his efforts if re-elected. LA County studies show that walking and bicycling make up nearly 20% of all trips and 39% of road fatalities, yet receive minimal funding. What steps would you take to better align funding with usage and safety? I plan to look at all the funding mechanisms from all levels of government, not just the County, to maximize our revenue for bicycle safety. We’ve had two serious bike accidents, one fatal, on Catalina Ave. in the last year. Partly to blame, in my opinion, is lack of education. If the workers of the moving company had known how dangerous it was to leave their equipment in the street, the accident they caused would have never happened. Please see pg 255 of the Bicycle Master Plan for the full Redondo Beach Plan and p278-279 for a map of planned bikeways. I enjoy riding my bike whenever I can in place of a car so although I cannot think of a single memory it is the accumulative memories over the years which has a lasting effect on me. I rarely ride my bike east to west; I am usually on a beach route (bike path, etc) riding north/south. Yes I believe if organized properly/responsibly that community events like this are great for all involved. I feel education is the key to making change so yes offering biking offenders with minor traffic violations the opportunity to learn why their violations can lead to bad outcomes in lieu of them paying a heavy fine probably would have a better overall effect. I would need more information before committing to any numbers but I generally support adding bikeways if it does not have a negative impact on the city, parking, etc. I support an Aviation bike lane so long as it does not negatively affect vehicle traffic, parking, etc. I agree that creating incentives for people to ride bikes/walk in lieu of driving their vehicles makes great sense so long as the new proposed bike lanes, etc do not create a negative impact on vehicle drivers. If transportation funds are allocated into “win-win” situations then everybody benefits since more bikers/walkers results in less vehicles and less vehicles will improve the flow of traffic. I cannot say if 10% is the correct percentage to allocate as it could be more or less depending on the circumstances/opportunities available. Yes some of our city staff time should be allocated into pursuing grants since grants have a tremendous impact on what projects are really possible each year; I would need to see the list of grants available before committing to how much of the staff time be allocated to bicycle grants. I would first need to see what has worked in other cities to decrease these statistics and from that decide what is the best approach for our city. If there are some proven methods to improve safety for bicyclists/walkers then certainly we should aim towards those. Please include your thoughts on the questions below by Feb 17. We will compile and send to all our members. I grew up in rural Pennsylvania where my friends were miles apart. Bicycling was the only way I could visit friends of go to events without being driven by my parents. Country roads and Pennsylvania drivers are not bike friendly. California is the most bike friendly state I have lived in. I feel safe going North to South. Going east and west beyond PCH is not so convenient. I believe we should work with Edison to get a bike path down their right of way on 190th. Yes! I would welcome this and if it wasn’t during work hours, I would participate. Yes. I think this is an excellent idea. I support bikeways, but I cannot commit to a set number of miles without seeing the costs and the solutions. I also think some of the conclusions of the bike plan will pit bicyclists against non-avid or non- biking residents and may cause an unnecessary backlash. For example the recommendations for “road diets” on Catalina and Prospect were not vetted to the non-biking community and I don’t think it fair to assume that a non-biker would review the master plant so they could weigh in on such a big change. I also think a sharrow might work better in these situations versus the road diet. I bike down Catalina all the time and have never felt endangered or crowded. I also participated in the Harbor Drive meetings on the bike path. I believe bicyclists should really look at the safety of the solutions proposed. I have researched roundabouts or traffic circles, and the number one accident in traffic circles is between bicyclists and vehicles. Also a two track path on the west side of Harbor Drive will impact the safety of bicyclists at the many driveways. Without signalization at the driveways, I believe this is a dangerous solution. And with signalization it would be a lot of short stops and starts for bicyclists. I support bike lanes on Aviation so long as they do not impede traffic flow. This is a main arterial for Redondo and at rush hour it is at an LOS of F. If we constrain it more, it will drive more through traffic. A bike lane will make it safer for bicyclists and we need to do something. I do want to encourage bike commuting and to do that we need to make it safe. Yes, I fully support improvement and expansion of our bicycle and pedestrian infrastructure. First off, although I realize the coalition did a study of bicycle trips, I believe an integrated pedestrian, bicycle and traffic study needs to be done so the data is collected at the same times and accurately reflects all modes of traffic. I discussed this with the City’s traffic engineer and she agrees the data we have today does not correlate and is useless for real design and solution assessment. This data would help us prioritize expenditures where they would be most effective to promote more bicycling and walking and less driving. Second, Measure A affords the opportunity to open up a new east west route down 190th in the current Edison Right of Way. This can integrate with bike paths on the edges and through the open space created by Measure A. This way we can better connect North and South Redondo and communities inland with our waterfront bike routes. Also Measure opens the opportunity to decrease Harbor Drive traffic by locating harbor area parking at the AES site.. I appreciate the opportunity to answer these questions. You will have a supporter should I get elected. motorists to drive safely and how important it is to have a proper bicycle infrastructure for the safety of those on bicycles and in cars. whose been on these streets know which ones are safe and which ones are not. 3) I would most definitely support such an event. In fact, when elected, I would personally work towards organizing it. The city would greatly benefit from doing something similar to what Los Angeles did. Residents and businesses could definitely take advantage. 4) If the money is there, I would not be opposed to it. 5) I would commit to implementing as many miles as reasonably possible. bicyclists.? Is it the best route? 8) Yes, I think it’s extremely important that we continue to apply for and receive grants for any projects pertaining to Redondo Beach, including grants for transportation and bicycle infrastructure. 9) I feel full implementation of the Bicycle Master Plan would dramatically improve safety for bicyclists. And when elected, I’ll work closely with the community to make certain that the bicycle plan is implemented and effective. Growing up in Newport Beach, bicycles were a part of my childhood. Riding my bike to and from school, 3rd grade through high school was something I did with friends, unless it rained. But, the memory that stands out most is the day I learned to ride a bike; that day made all my other bicycle memories possible. I started riding a bike when I was 5; it took a year or more for the training wheels to come off. I remember the pride on my dad’s face and the excitement I felt when they did. I was in front of my house in Newport. My bright yellow Schwinn with its floral daisy seat stood on the sidewalk. My dad held the seat from the back and I got on, so shaky and afraid. But, my dad held the bike steady and upright, I got on and he cheered me the entire way as he ran behind me, promising not to let go – his booming voice didn’t seem as close at one point. I looked back and saw him behind me – he did let go, I was riding my bike and as soon as I realized I was on my own, I went down – my first ride and my first fall; there was no time to cry; he caught up with me held the bike steady, told me how to position myself for better balance and got me going again. That day, was the day I learned to ride a bike and the exhilaration that comes from conquering fear and making parents proud. I only feel safe riding my bike on the strand; I am weary on any city street (some more than others) because drivers don’t know how to share the road (even with responsible cyclists). Distracted drivers, in a hurry put cyclists, pedestrians – all of us at risk every day. I will feel safer when cell phone/texting laws are enforced and drivers pay attention to their surroundings. Definitely. Events like this would promote more than healthier modes of transportation – events like these bond families and build stronger communities. I would get bicycle rental companies involved so those without a bike could participate as well. It would vary by year, taking into consideration when streets are scheduled for maintenance and the sum of funds available. I would like to see the plan completed as soon as possible and would assist with grants, fundraising, whatever might be necessary — I’m not a fan of phasing in plans so slowly that upon completion of a given plan, the earlier phases are already in need of repair. Yes. I support bike lanes on all streets. If we are going to promote healthier modes of transportation, we should make our streets accessible and routes realistic to get from point A to point B; cities that truly embrace cycling as an alternate means of transportation should make all surface streets accessible to cars and cyclists. Successful programs currently exist in other cities and states. I would further investigate what makes them work so well and adapt, as appropriate; the Grant Road Improvement Plan and RTA (Regional Transportation Authority) are places I would start. Are We There Yet? Reconnecting America, would be another resource to utilize, in addressing this question, as well as the others. As an active cycling enthusiast and longtime resident of Redondo Beach, I strongly support the South Bay Bicycle Coalition master plan that identifies cycling infrastructure improvements throughout the area. As Chairman of the Redondo Beach Harbor Commission, I have had an opportunity to review numerous proposals that have attempted to improve circulation and traffic flow for bicyclists of all types and ages, and more importantly to increase cycling safety for everyone involved. The city is currently in a situation where there are a number of public and private infrastructure projects being contemplated simultaneously that must be integrated, including the construction of a cycle track along Harbor Drive and into the project area where the Waterfront Revitalization initiative will eventually be developed. These two segments must be given the highest priority as a matter of public safety. In their current state, there are at least five intersections or “choke points” from the north end of Harbor Drive/Herondo Avenue to Torrance Boulevard heading into the Redondo Pier that are very dangerous for anyone cycling or walking. These intersections need to be analyzed immediately before there are fatal accidents. My experience as a cycling enthusiast, dates back throughout my entire life as riding a bike to school or using your bike for a paper route was a daily commonplace occurrence. One key aspect of riding a bicycle was making sure the experience was safe above all else. That cannot be emphasized enough today in the urban environment we live in here in the Beach cities and in the South Bay. As the number of cyclists has increased, so has the need for cycling infrastructure improvements along our north/south and east/west corridors whether they be segregated tracks or “sharrow lanes” that give both cyclists and motorists a clear visual to follow. In addition, motorists need to understand that cyclists have equal rights-of-way and that they must respect their use of the road just as other vehicle types have had to for decades. Motorists must recognize the presence of cyclists by reducing vehicle speed, yielding when approaching cyclists, changing lanes as appropriate to widen the area upon approaching, and essentially sharing the road as you would on a sidewalk with other pedestrians. Efforts should be taken by the city to conduct community events that can showcase cycling best practices undertaken by other cities to increase cycling safety and improve vehicle traffic flow for cyclists and automobiles. A form of “safety fair” could include booths that offer attendees information materials to promote cycling safety, the newest in bicycle hardware technology, clothing that increases cyclists’ visibility for motorists, and other education-oriented exercises to improve cycling safety and elevate the cycling experience. The city also needs to increase its efforts to understand what funding sources are available at all levels of government and leverage existing public sector funds with private sector matches whenever possible. Opportunities frequently exist during the approvals for new developments and can be factored into conditional use permit applications on a regular basis. Given the upcoming Waterfront Revitalization initiative, improvements like the Shade Hotel on the West side of Harbor Drive, future uses along the East Side of Harbor on the AES property, and other opportunities that arise, the city needs to include bicycle planning as a criteria for all governmental reviews. The city should also make sure that cycling-related issues are incorporated into its Strategic Plan that is updated semi-annually. As cycling has increased in popularity for riders of all types and ages as a matter of improving one’s health and life style (Blue Zones), we need to incorporate what we are doing here in Redondo Beach into other South Bay cities’ cycling-oriented planning. Simply drawing bicycle routes around individual city boundaries is shortsighted and not addressing cycling in a systemic manner as it should be done. As a candidate for City Council in District 2, I am dedicated to addressing the needs of cyclists so we undertake as many steps as possible as a city to increase cycling safety, improve cycling opportunities, and elevate cycling’s interests throughout the city and South Bay area. Just as we need to restore balance and common sense in District 2, we also need to do the same on behalf of the cycling community. into my district. One of my few campaign promises 8 years ago was to renovate the Esplanade. I/wemade this happen by lobbying the federal government, ( Jane Harman) for funds. The only way wereceived Federal funds was by including the bike lane on the Esplanade. This was accomplished. 2. We are working with all parties concerned about the bike master plan. Hopefully soon we have dedicated bikes lanes on Broadway, Catalina and Prospect, in Redondo Beach. 1 Please share a memory involving a bicycle that has had a lasting effect on you (whether or not you were the one on the bicycle). My dad taking me out to buy my first Schwinn bicycle. I was from a big family and it was a right of passage to go solo with dad to the Schwinn shop. 2 Would you feel safe riding a bike from east to west through our city with family members? If not, what changes would make you feel comfortable on our city streets? 3 Would you support an annual active transportation community event (similar to LA’s CicLAvia) which would close a few streets for an afternoon and allow citizens to bike, walk, skateboard, and enjoy other healthy modes of transportation? Yes. Yes. Yes. I would like to see something like this more than just annually. Paris dose something like this monthly. Maybe we could target bi-annually. 4 Currently, bikers face the same traffic fines as drivers, up to $500. Several cities like Huntington Beach created optional classes allowing first-time offenders to go to “Biker’s Education” once to learn safer practices in lieu of paying the full fine. Would you support a similar program in our city? This is hard to put a number on. I am very committed to alternative travel in hopes of reducing vehicular traffic and pollution. Biking is the #1 alternative. If we can get the money, let’s build the bike paths!! 6 The three beach cities are studying the addition of bike lanes on Aviation to allow better commuting across cities. Do you support new bike lanes on Aviation without removing any traffic lanes? 7 The county provides sales tax monies, called Measure R funds, to each city for transportation only. Many cities like LA, Long Beach, and Redondo are spending 10% of these to fund bicycle and walking infrastructure. 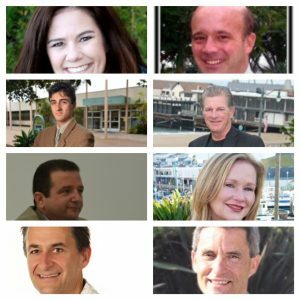 Would you continue to support Redondo’s approach for bike and walk infrastructure if elected? 8 Over the past 5 years, Redondo Beach has received millions in funds in state and county grants for cycling. Our city has been in the forefront of applying and receiving these grants. Would you support staff time for continuing to applying for bicycle infrastructure grants? Yes. I think a bike friendly Redondo Beach is a better Redondo Beach. 9 LA County studies show that walking and bicycling make up nearly 20% of all trips and 39% of road fatalities, yet receive minimal funding. What steps would you take to better align funding with usage and safety? I think applying for grants is a great start (your question 8) I think that bike/walking issues should be at the forefront of virtually all of our city plans ie, harbor drive, waterfront, Aviation. Our bike and walking paths can help make Redondo more unique than it already is.